Marathon Gold Corporation (TSX: MOZ) is excited by our continued success in predicting and intersecting high-grade gold mineralization at open-pit depths in the southwestern part of the Marathon Deposit (Figure 1). Drill holes MA-18-336 to MA-18-339, MA-18-341, MA-18-343 and extended drill hole MA-17-216 all succeeded in intersecting significant intervals of good gold grades as we continue to further define the main mineralized corridor in this southwestern part of the Marathon Deposit; focusing on widening the shallow open pit resources and decreasing strip ratio. Sherry Dunsworth, M.Sc., P. Geo., Senior VP of Exploration, Marathon’s Qualified Person, has reviewed the contents for accuracy and has approved this press release on behalf of Marathon. Thorough QA/QC protocols are followed including the insertion of blanks and standards at regular intervals in each sample batch. Drill core is cut in half with one half retained at site, the other half tagged and sent to Eastern Analytical Limited in Springdale, Newfoundland. All reported core samples are analyzed for Au by fire assay (30g) with AA finish. All samples above 0.10 g/t Au in economically interesting intervals are further assayed using metallic screen to mitigate the presence of coarse gold. Significant mineralized intervals are reported in Table 1 as core lengths and estimated true thickness (75-95% of core length). 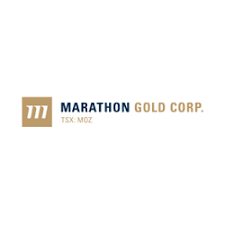 Marathon is a Toronto based gold exploration company rapidly advancing its 100% owned Valentine Lake Gold Camp located in Newfoundland, one of the top mining jurisdictions in the world. The Valentine Lake Gold Camp currently hosts four near-surface, mainly pit-shell constrained, deposits with measured and indicated resources totaling 2,691,400 oz. of gold at 1.85 g/t and inferred resources totaling 1,531,600 oz. of gold at 1.77 g/t. The majority of the resources occur in the Marathon and Leprechaun deposits, which also have resources below the pit shell. Both deposits are open to depth and on strike. Gold mineralization has been traced down over 350 meters vertically at Leprechaun and almost a kilometer at Marathon. The four deposits outlined to date occur over a 20-kilometer system of gold bearing veins, with much of the 24,000-hectare property having had little detailed exploration activity to date. The Valentine Lake Gold Camp is accessible by year-round road and is located in close proximity to Newfoundland’s electrical grid. Marathon maintains a 50-person all-season camp at the property. Recent metallurgical tests have demonstrated 93% to 98% recoveries via conventional milling and 50% to 70% recoveries via low cost heap leaching at both the Leprechaun and Marathon Deposits.